Seats are limited, so apply today! Sponsorship are available. See below. 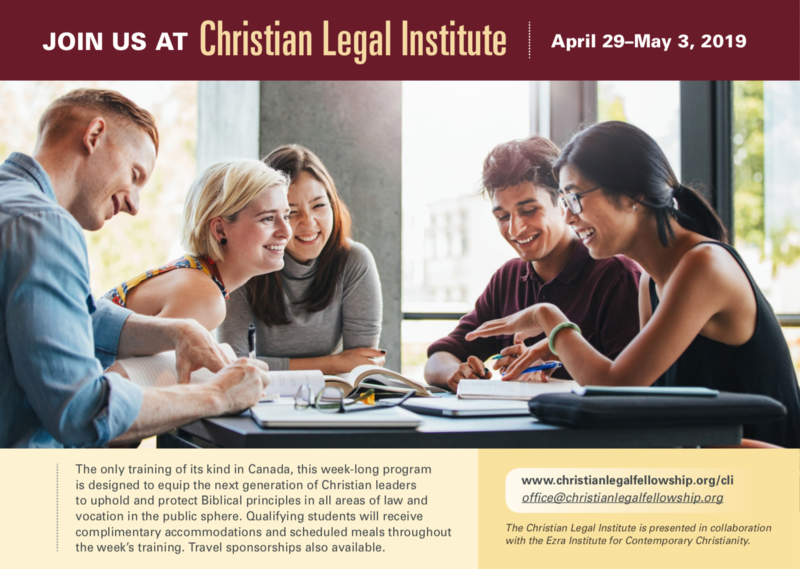 Founded in 2009, the Christian Legal Institute ('the Institute' or CLI) is designed to equip students and others to articulate a robust Biblical worldview in a variety of vocations including law, politics, education, media, arts, medicine, and business. Applicants will be challenged and trained to engage their peers and professors in discussions relating to Christian involvement in public life and be transformed in their thinking in addressing the issues facing our society. This week-long program attracts legal practitioners and multi-disciplinary scholars from across Canada and around the world. Join us for a challenging week of teaching, delivered by leading thinkers and practitioners coupled with the opportunity for fellowship, discussion, prayer, and worship. Our aim is to prepare delegates to be passionate, servant-hearted, Christ-centered leaders within a wide variety of vocations. We hope that they will also develop lasting friendships with peers and mentors that will be a source of support, encouragement, growth, and accountability for years to come. To start your application click on the "Apply/Register" button above or at the bottom of each page. Please read the instructions carefully and complete all application questions. Applications will be processed on a 'first-come, first-served' basis, and seats are limited, so start your application today! Sponsorship funds are available for CLF students and other qualifying students upon submission of a Sponsorship Application and notification of acceptance. CLF members are given priority and sponsorships are considered on a first-come, first-served basis. See the "Fees and Sponsorship" page for additional details. Christian Legal Fellowship (CLF) is a national charitable association that exists to serve the legal profession by deepening and strengthening the spiritual life of its members, and to encourage and facilitate among Christians in the vocation of law the integration of a biblical faith with contemporary legal, moral, social, and political issues. CLF also seeks to advance the public good by articulating legal and moral principles that are consistent with, and illuminated by, our Christian faith through court interventions and parliamentary consultations. The CLF’s membership consists of nearly 650 lawyers, law students, professors, and others who support its work. It has chapters in cities across Canada and student chapters in most Canadian law schools. While having no direct denominational affiliation, CLF’s members represent more than 30 Christian denominations working in association together. This year marks the 10th Anniversary of the Christian Legal Institute! For the fifth time, Christian Legal Fellowship is linking arms with the Ezra Institute of Contemporary Christianity (EICC) to present the Christian Legal Institute. We are excited to join together again this year! The Ezra Institute for Contemporary Christianity is an evangelical Christian organization committed to the training and equipping of Christians in the areas of Christian apologetics, missiology, and the cultural mandate. Our goal is to assist Christians in the bringing of all things, in every area of life and thought, into captivity to Christ. For more information on EICC, visit www.ezrainstitute.ca. Stay tuned for details on topics, agenda, and speakers!